BigBadCon 2014 was a really memorable experience for me. Not because it is one of the best role-playing conventions I’ve ever attended, because it wholeheartedly is just from the level of play exhibited by all of the players and game masters. No, the reason why it was so memorable was because it was an event I’ve been looking forward to for months that I tried to enjoy as best I can while fighting through honeymoon jet lag of the Japan and Taiwan variety. Not fun. Especially in an improv hobby such as role-playing games where energy level can make or break many a game. Whiny Huy aside, BigBadCon is definitely a top notch event for those looking for role-playing games in Northern California. The clear focus on story-based systems rather than crunch-heavy systems brings with it a level of collaboration that you wouldn’t get otherwise. It hearkens back to the same creative freeform play of yesteryear of the more rules-light Basic Dungeons & Dragons, but made wholly to mimic story beats and narrative flow of some of our favorite fiction and their genres instead of the also fun dungeon-delving for treasure play of Conan the Barbarian. In terms of logistics, BigBadCon is ran like a well-oiled machine. The people running it understand that your time is precious and that proper scheduling is paramount. The only downside to accomplishing this is that the sign-up period is a mad dash of securing the first slots available and it’s definitely one of the compromises that detract from the first-come, first-served system. I don’t know if I’ve ever been as happy and immediately sad from simply signing up for something since Comic-Con 2012 (I got into the FATE Star Wars game that I wanted, but didn’t get into the Tenra Bansho Zero game that I wanted). But at least I got it all out of the way instead of wondering for weeks on end whether I would get in so that I could plan for other games or obligations. So on the morning of the convention, I made a trek all the way up to what looked like a weird backwater section of Oakland. Little did I know that there was quite an accommodating hotel venue that was hiding between the airport and the warehouses. While that isn’t far from where I live in Mountain View, waking up especially early to attend my 10AM game — Atomic Robo RPG: Teenage Mutant Ninja Turtles & Other Strangeness ran by Morgan Ellis — was especially hard since I was still jet lagged. So yeah, I was dead tired. But who could possibly pass up the opportunity to pretend being a weird human-animal mutant-hybrid from 80s and 90s cartoons? Not me. If the thought of that doesn’t make you smile, you either have no soul or didn’t grow up with enough fun in your life. The game ended up being my first convention game with FATE, showing just how versatile and narratively focused the system is. It really does get out of the way and its ability to support the modeling of many stories that we love, with heroes should struggle and fail, but later succeed is beautiful. Morgan Ellis was extremely creative, coming up with things on the fly and he created a memorably demented mastermind character that Eric Lytle played off of. Eric Lytle and Stephen Hood also had a great dynamic going, playing both genius-level characters — one of magic and the other of science — that constantly bickered which approach was better. Monika Hortnagl played an especially stealthy ninja with a lot of descriptive flavor and I played…a science experiment crocodile commando with a trench coat and tons of guns. Heck yeah. That was fun. My commando was also a master of Galaga, as he leveraged a scene earlier demonstrating his skill on a beat-up cabinet, in our underground sewer, to shooting down dozens ninjas jumping down in Galaga-triangle formation from another building stories above. 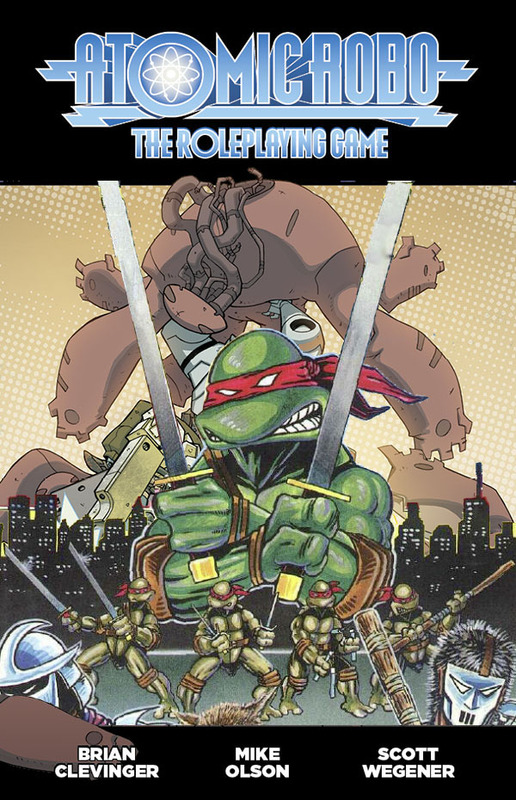 Atomic Robo The Roleplaying Game: Teenage Mutant Ninja Turtles?!?! My second game was the game I didn’t get into at KublaCon 2014 (and it was the one game that I had to get in), so you know I was gleefully celebrating when I got the sign-up. I mean to play in such a big-scale 8-hour character-focused Star Wars game? A total dream. The only issue was that pent up fatigue hit me hard in the afternoon and all of the Thai food from the food truck out back couldn’t save me. I soldiered on though and with a great GM like Dovi Anderson, it was impossible to not smile constantly. The guy was prepared, with cameraman scene establishment, and walked through scenes like it was second nature to him. Best of all? He was also a real Star Wars fan, so you know he loved it as much as you did. The game’s premise is that Master Kellian — a former Jedi that worked to establish the empire with Anakin Skywalker during Order 66 — deserted and hid to train force-sensitive students. The players are, of course, the force-sensitive students that he has picked up on his journey, destined to carry out some great task that only they can accomplish together. The only problem? They’re all built to conflict with one another, establishing connections that players can latch onto and build on right away. I won’t spoil the rest since I hope that whoever is reading this considers looking around for Dovi’s game — Kellian’s Fist — at a Northern California convention, but believe that the reveal is epic and definitely Star Wars. One thing I do want to point out from the game is that Dovi asked us all to establish an opening scene. After being delighted by the other players around the table with great openings, I created an opening that I thought would suit my warrior-monk like force student. The scene starts with a huge icy cavern and large stalactites dripping from the morning’s sun. You see him waking up, wearing very little, but not wet at all. Then it pans out and you see hundreds of tiny buckets that are perfectly put in place to catch all of the water. Now I thought the imagery here was pretty cool, but then Dovi added that as I left the caverns to attend the morning’s lesson, my character force flicked a bucket across the room and a single drop of water enters it. That was so right and I hope you understand how great of a game master Dovi Anderson is. Other players like Gil Trevizo and Paul Bezultek created many memorable moments, especially Gil whose character demonstrated his evolution the most throughout the game. He played the most disagreeable character that also had the strongest tilt to bringing the group together. I asked him how he did it so well and he nonchalantly told me to just listen to the character. When he got his character sheet, he thought about where he started and where he wanted it to end. It really is always about the fundamentals. Hanging out and talkin’ shop. The Star Wars game ended at 12:45AM and I’m sure you’re thinking — at this point, aren’t you dead? I mean jet lag should have done me over, right? Luckily for me, I actually ended up getting a second wind and was able to help cleanup and hang out with Dovi, Gil, Matt Steele (who came by after GMing a game), and another guy who hung out that I don’t remember the name of (darn). Now you might be thinking, why don’t you get some sleep for your next game? Well, like any convention goer you’ll ever talk to — it’s the hanging out that always makes the biggest impression. We spent hours nerding out into the night about Star Wars, Marvel, foreign movies, RPG conventions, and life. I told these guys about my recent wedding ceremony and stories about introducing these nerdy things to my wife and favorite person. They could all relate. We laughed, we sympathized, and we cheered as we passed the night with the stories of sharing such hobbies with someone you cared for. We talked about the future of the nerd culture and the future of the RPG hobby. Everything about the convention was worth it. Oh yeah, I also realized I was in no shape to play in a 10AM game the next day also ran by Morgan Ellis. I tried to tell someone to let Morgan know to not save my spot, but I felt really bad about not making it. I ended up waking up around noon when I finally back to life. Dovi Anderson (Pixar animator and convention GM). Thank you for running the Star Wars game, it’ll go down as one of the most memorable tabletop RPGs I’ve ever played. And thank you for just hanging out with Gil, Matt, the guy I wish I remember the name of, and me into the wee hours of the night talking Star Wars, foreign films, and super heroes. Gil Trevizo (convention GM). Thanks for demonstrating expert-level playing skills and just hanging out. The best part of the convention was definitely just sitting around with you guys and talking nerd. Matt Steele (RPG convention organizer, convention GM, and writer). For being awesome and again, hanging out with all of us that night. Good luck on that pilot script you were rushing through to write. Morgan Ellis (convention GM and game designer). Thanks for running the TMNT game! It was my first convention FATE game and I was really excited to see it in action. Stephen Hood (for me, the Storium guy). Thanks for playing and for just being a really cool guy. I backed Storium early on and I know the final product will be great. Eric Lytle (game designer). Your evil genius character was hilarious. That is all. Fred Hicks (Mr. Evil Hat himself!) . Didn’t get to say hi, but it was great to see the father of Evil Hat and creator the great system known as FATE. Here’s to you BigBadCon! May you continue igniting people’s imaginations and fostering creativity for years to come. It was fun.